It all started with a bout of flu last month. I woke up famished, but I had no one to take care of me and no cash in my wallet at the time to buy food, not to mention I was feeling really weak. But, remembering that I was enrolled to Citi Mobile, I decided to simply have food delivered, sparking an addiction to fast food delivery that up to this moment I am trying to subdue. At the very least, though, I have acquainted myself with the following Citi Mobile-accepting fast food joints' delivery services, and their comparison, ladies and gentlemen, is what I'd like to share with you today. 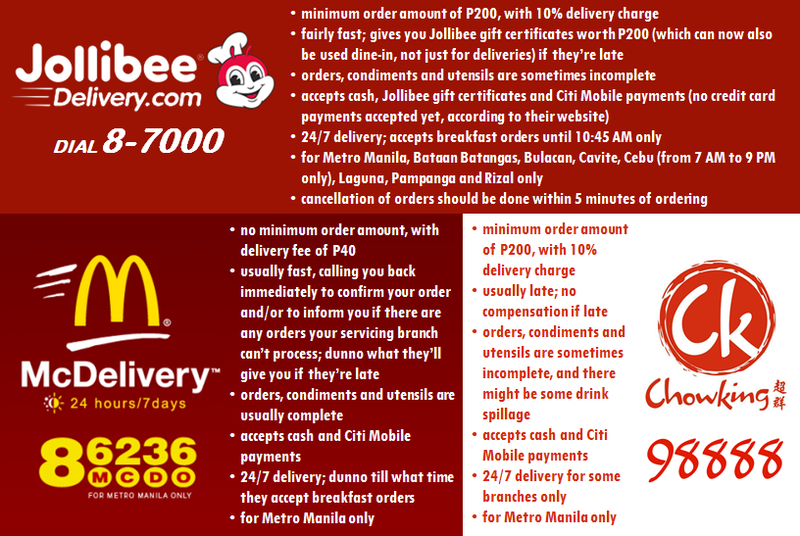 Who doesn't love Jollibee? What Pinoy didn't grow up to the langhap-sarap goodness of their food—the guilt-inducing saltiness and crunch of their Chickenjoy's skin which I always save for last, the unique crisp of their French fries which can be ordered extra large for those who don't mind the calories, and the warmth of their gravy and mushroom sauce which (aside from KFC's) we all love to pour on to our plates so that our rice and ulam are swimming in them. The food is great dine-in, though only most of the time, when they obligingly give you the Chickenjoy part you requested, when they don't get cheap on your burger steak's mushrooms, and when their non-refillable gravy isn't too diluted. They're also hit-and-miss with their delivery service, with me only getting from them two hits out of four so far. During the first miss, they recorded my payment as cash instead of Citi Mobile. Thankfully, showing the delivery guy the text payment confirmation from Citibank sufficed. I received a call from the delivering branch later, however, and they said they'll have to send the delivery guy back to have me sign a new receipt. I reluctantly agreed, even if I was about to sleep already, but the guy didn't return. That entire experience should have reminded me that laziness simply won't do, especially when there's a Jollibee just a few blocks from my house, but sloth got the best of me once more, and during the second miss, which was only last Sunday, they apparently forgot to tag my payment as Citi Mobile again. This time I knew it was the phone agent's fault and not the branch's, because I didn't get any text alert until I called their hotline to follow up 20 minutes later. Thirty-five minutes after I had finally gotten the text payment confirmation, the food still hadn't arrived. I called their hotline for the last time and reminded them I should be compensated for waiting over an hour after my initial call. When the delivery guy arrived 10 minutes later, he didn't seem like he was going to initiate giving me the P200 gift certificate the last phone agent had promised me, that is, until I reminded him. On top of all that, my order didn't come with any utensils. 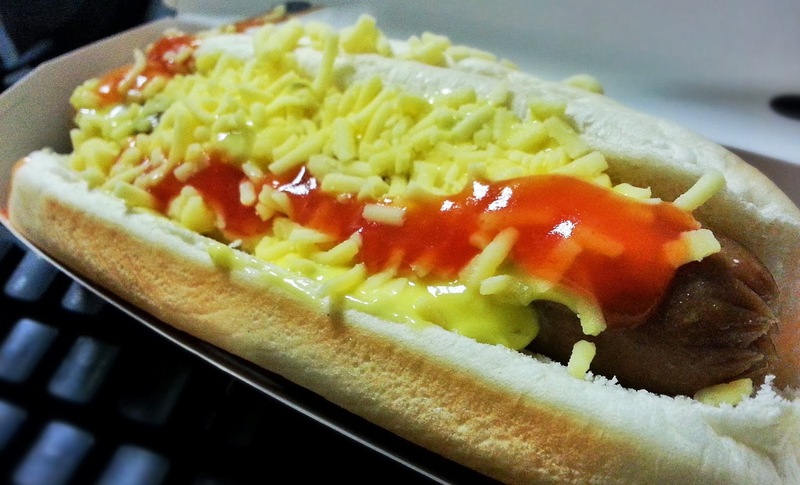 Jolly Hotdog, one of my Jollibee menu favorites. I know, I shouldn't be eating too close to my keyboard, but not even the spaces between those keys could rob me of all that cheese which is rightfully mine. I don't know why but growing up, when I was out for the weekend with everyone in my family, we seemed to always go for Jollibee, but when I was out with just one of my parents, either after my Saturday school extracurriculars or a trip to the wet market with my mom, we seemed to always go for McDonald's. My dad liked to collect Happy Meal toys for my brother and me, and I never outgrew McDonald's McNuggets and apple pie. My high school friends and I frequented the McDo in Cavite City Palengke (marketplace), whose second story tables became witness to our dipping a trayload of French fries in hot fudge sundaes (caramel sundae for me) while we chatted, laughed, sometimes quarreled, but generally had fun. Those were all fond memories and I have no complaints about McDonald's so far, except maybe they should bring back the large apple pie and make Twister Fries a permanent menu offering. (They already brought back the iconic Happy Meal box recently, which makes me happy even if I no longer buy Happy Meals.) Theirs is the best delivery service I have received so far too. You get a call from the servicing branch to confirm all the items you've ordered, and their riders are fast, arriving in less than 20 minutes. Probably too fast, however, as the first time I got barely cooked McNuggets. They were still McNuggets though so down my stomach they still went. 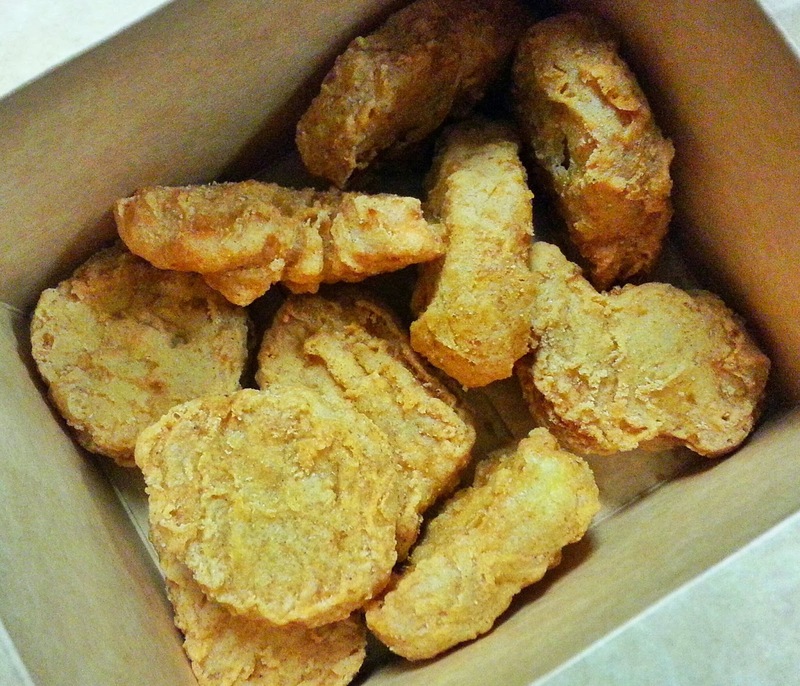 I never knew until recently that McDonald's had 10-piece Chicken McNuggets in their menu. Happiness does come in a box. Chowking, despite my usual dine-in experience of waiting too long for my order, holds a special place in my heart because of two words: Halo-halo Wars. I and my church friends in college would arrive at the Chinese fast food joint, order two or three Halo-halo Fiestas with two scoops of ice cream each, wait for our orders for longer than the acceptable time, mix the cold desserts thoroughly when they arrive (which is hard considering how the large chunk of ice underneath, when left unmelted, does not leave much space for mixing), and then attack our bowls like they held the last source of nutrients our mouths would ever bite into. Unbeknownst to our fellow diners (who most likely thought us uncouth), our objective was to get the most leche flan bits for ourselves. Yes, we were that childish, and the fun was almost enough to eclipse the establishment's service issues. When I had the flu last month, however, the first thing that popped into my head when I thought of comfort food to be delivered to me was Chowking's beef wanton mami. How I craved for the noodles, the pieces of lettuce swimming in beef broth rich in MSG, and of course the wanton dumplings and chunks of beef topping the whole thing. But having a big appetite, I also wanted a Chowking Lauriat meal. So I ordered their Golden Chinese Pork Rice Lauriat. And large nai cha (milk tea) to make me feel better. The food arrived a little over an hour later, with a quarter of the nai cha spilled and no soy sauce for the Lauriat's siomai, but as I was too sick to bring this up over their hotline or even with the delivery guy (who said he got lost, hence the delay), I just inhaled my food and returned to bed with my cold medicine and readings. 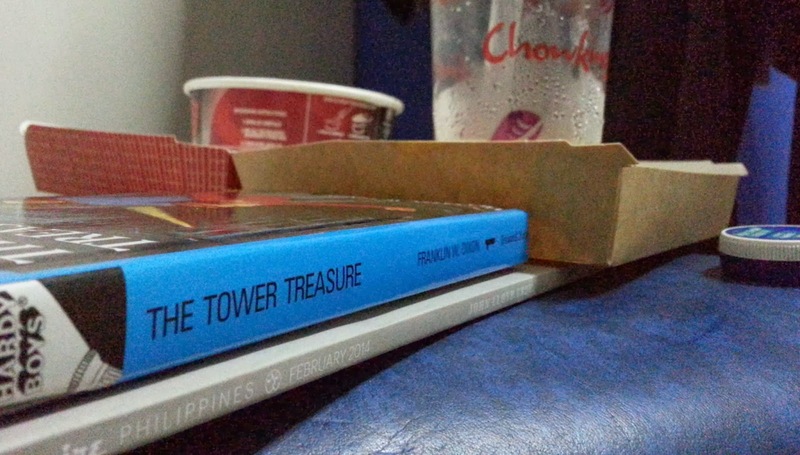 This photo of my bedside sums up all I did that day: read The Hardy Boys and the February issue of Esquire while munching on delivered food and sniffing Vicks VapoRub. Here's a comparison table, but so you wouldn't have to read through the whole thing, just get off your behind and buy food! McDo's Twister Fries, gawing habambuhay! Hahaha! Plus, I also think of their noodles soup as comfort food when I'm down with a flu. BTW, you should get paid for this. Hahaha. Tama! Forever Twister Fries! Although I think if they did that, magsasawa rin tayo agad. Might do them good to let the public know that there's like a regular time frame, say, yearly when they'll have it though. YES! Miss those good, old times.